The other night we had a BYOB (bring your own baby) party with some friends. We decided to take advantage of the good weather and do some grilling. 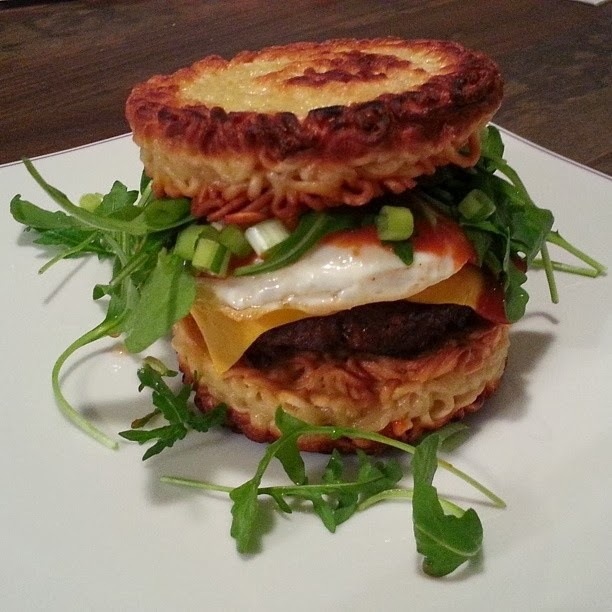 Our friend Robison made us try his Ramen Noodle burger creation and it was delicious so I thought I’d share. 1. Cook ramen according to the package directions. 2. Beat 2 eggs in a bowl and season with salt and pepper. Stir noodles into eggs until evenly coated. 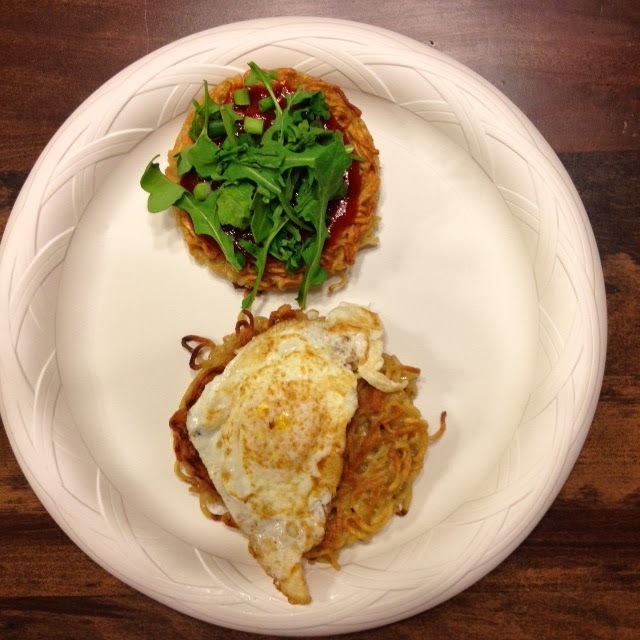 Divide noodles into burger-size ramekins or bowls. Place a sheet of plastic wrap directly over noodles and stack another bowl on top to flatten noodles. Refrigerate until firm (about 20 minutes). 3. Meanwhile, cook your hamburger patties (We grilled ours!) and cut up some green onions. 4. Heat about 1 tablespoon vegetable oil in a large skillet over medium-high heat. Carefully remove the ramen from each bowl so that it doesn’t lose its shape. 5. Fry each ramen bun, without moving noodles, in hot oil until golden brown (about 3 minutes). Flip each bun and continue frying until crispy. 6. Fry eggs to your liking. 7. 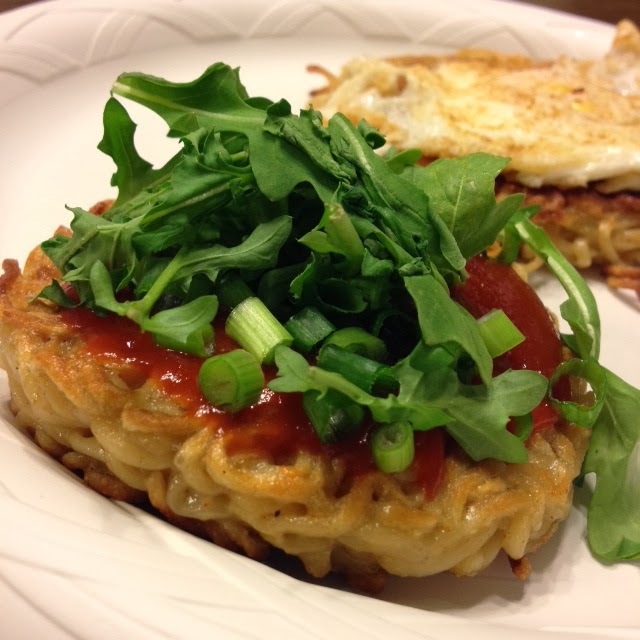 Put together your Ramen Noodle burger complete with sriracha ketchup, arugula, green onions, and cheese! Have you ever read the label on the ramen pack? REALLY high fat and 0 nutrition. Sorry, I'm trying to keep my arteries clear 🙂 I's love a great whole grain bun though with the rest! Your right, a wheat bun would be healthier! Every once in awhile, it's fun to try something new and you need a cheat day! Hi Lou Lou Girls – Thanks so much for linking up with the Let's Get Real Party this week. Mmm, I like the idea of making ramen noodles into "buns". What a nice change up! Love the fact that it is a very do-able recipe. Pinned! My husband LOVES burgers and he LOVES ramen. This MUST be his new favorite. I'll let you know. Thank you!